Kazan Clark: ...for my Special Teacher.. This is so beautiful Kazan..!!! Love, love, love it..!!! hugs girly..wow Kindergarten, how cute...how do you feel about your baby going to school, sad, excited, both? This is darling Kazan!! I love your interpretation of the sketch!! CUTE!! oh my goodness....how cute is this?!! looooooooove the different pp in the apples! perfect! What a fun card! Love the apples in different papers! 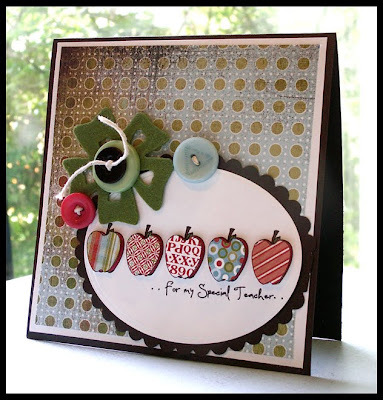 The apple card is so cute and I think the Kindergarten teacher will love it! I like how you cut the apples out and used different patterns. This is darling Kazan! Ashton's Kindergarten teacher will adore it! Thanks for playing at 2S4Y! What a perfect teacher card Kazan! !Love it!! Oww I love these little apples on a row. Great! Thanks for sharing. And have a great monday! oh my goodness Kazan, what an adorable card! very cute and very school like feel! Love this card, Miss Kazan!! This card is such a fun card and I am sure the teacher will just love it. Girl, this card is just FABULOUS!! I love the apples. It is just so well put together and I know the teacher that receives it will cherish it. Beautiful job. Super cute Kazan, such yummy looking apples! !